From Romantic Castles and Palaces, As Seen and Described by Famous Writers, edited and translated by Esther Singleton; New York: Dodd, Mead & Company, 1901; pp. 254-259. WE passed through the outer rampart of Queen Anne; through the old round gate-tower of an earlier day, and beneath the vacant arch where the portcullis used to fall, thus reaching the inner region, where stand the old palace on one side and the old Parliament House on the other. The former looks aged, ragged and rusty, but makes a good appearance enough pictorially, being adorned all round about with statues, which may have been white marble once, but are as grey as weather-beaten granite now, and look down from beneath the windows above the basement story. A photograph would give the idea of very rich antiquity, but as it really stands, looking on a gravelled courtyard, and with “Canteen” painted on one of its doors, the spectator does not find it very impressive. The great hall of this palace is now partitioned off into two or three rooms, and the whole edifice is arranged to serve as barracks. Of course, no trace of ancient magnificence, if anywise destructible, can be left in the interior. We were not shown into this palace, nor into the Parliament House, nor into the tower, where King James stabbed the Earl of Douglas. When I was here a year ago, I went up the old staircase and into the room where the murder was committed, although it had recently been the scene of a fire 255 which consumed as much of it as was inflammable. The window whence the Earl’s body was thrown then remained; but now the whole tower seems to have been removed, leaving only the mullions of the historic window. We merely looked up at the new, light-coloured freestone of the restored tower in passing, and ascended to the ramparts, where we found one of the most splendid views, morally and materially, that this world can show. Indeed, I think there cannot be such a landscape as the Carse of Stirling, set in such a frame as it is, — the Highlands, comprehending our friends Ben Lomond, Ben Venus, Ben An, and the whole Ben brotherhood, with the Grampians surrounding it to the westward and northward, and in other directions some range of prominent objects to shut it in; and the plain itself; so worthy of the richest setting, so fertile, so beautiful, so written over and over again with histories. The silver Links of Forth are as sweet and gently picturesque an object as a man sees in a lifetime. I do not wonder that Providence caused great things to happen on this plain; it was like choosing a good piece of canvas to paint a great picture upon. the battle of Bannockburn (which we saw beneath us, with the Gillie’s Hill on the right), could not have been fought upon a meaner plain, nor Wallace’s victory gained; and if any other great historic act still remains to be done in this country, I should imagine the Carse of Stirling to be the future scene of it. Scott seems to me hardly to have done justice to this landscape, or to have bestowed pains enough to put it in strong relief before the world; although it is from the 256 lights shed on it, and so much other Scottish scenery, by his mind, that we chiefly see it and take an interest in it. I do not remember seeing the hill of execution before, — a mound on the same level as the castle’s base, looking towards the Highlands. A solitary cow was now feeding upon it. I should imagine that no person could ever have been unjustly executed there; the spot is too much in the sight of heaven and earth to countenance injustice. Descending from the ramparts, we went into the Armoury, which I did not see on my former visit. The superintendent of this department is an old soldier of very great intelligence and vast communicativeness, and quite absorbed in thinking of and handling weapons; for he is a practical armourer. He had a few things to show us that were very interesting, — a helmet or two, a bomb and grenade from the Crimea; also some muskets from the same quarter, one of which, with a sword at the end, he spoke of admiringly, as the best weapon in the collection, its only fault being its extreme weight. He showed us, too, some Minie rifles, and whole ranges of the old-fashioned Brown Bess, which had helped to win Wellington’s victories; also the halberts of sergeants, now laid aside, and some swords that had been used at the battle of Sheriffmuir. These latter were very short, not reaching to the floor, when I held one of them point downward, in my hand. The shortness of the blade and consequent closeness of the encounter, must have given the weapon a most dagger-like murderousness. Hanging in the hall of arms, there were two tattered banners that had gone through the 257 Peninsular battles, one of them belonged to the gallant 42d Regiment. The armourer gave my wife a rag from each of these banners, consecrated by so much battle smoke; also a piece of old oak, half-burned to charcoal, which had been rescued from the panelling of the Douglas Tower. We saw better things, moreover, than all these rusty weapons and ragged flags; namely, the pulpit and communion-table of John Knox. The frame of the former, if I remember aright, is complete; but one or two of the panels are knocked out and lost, and, on the whole, it looks as if it had been shaken to pieces by the thunder of his holdings forth, — much worm-eaten, too, is the old oak wood, as well it may be, for the letters MD (1500) are carved on its front. The communion table is polished, and in much better preservation. Then the armourer showed us a Damascus blade, of the kind that will cut a delicate silk handkerchief while floating in the air; and some inlaid match-lock guns. A child’s toy-gun was lying on a work-bench among all this array of weapons; and when I took it up and smiled, he said it was his son’s. So he called in a little fellow of four years old, who was playing in the castle yard, and made him go through the musketry exercise which he did with great good-will. This small Son of a Gun, the father assured us, cares for nothing but arms, and has attained all his skill with the musket merely by looking at the soldiers on parade. Our soldier, who had resigned the care of us to the armourer, met us again at the door, and led us round the 258 remainder of the ramparts, dismissing us finally at the gate by which we entered. All the time we were in the castle, there had been a great discordance of drums and fifes, caused by the musicians who were practicing just under the walls; likewise the sergeants were drilling their squads of men, and putting them through strange gymnastic motions. Most, if not all, of the garrison belongs to a Highland regiment, and those whom we saw on duty in full costume looked very martial and gallant. 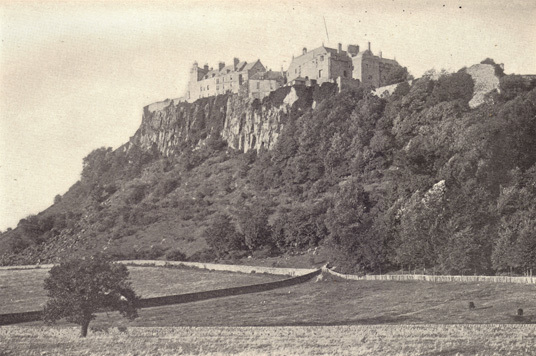 Emerging from the Castle, we took the broad and pleasant footpath, which circles it about midway on the grassy steep which descends from the rocky precipice on which the walls are built. This is a very beautiful walk, and affords a most striking view of the Castle, right above our heads, the height of its wall forming one line with the precipice. The grassy hillside is almost as precipitous as the dark grey rock that rises out of it, to form the foundations of the Castle; but wild rose-bushes, both of a white and red variety, are abundant here, and all in bloom; nor are these the only flowers. There is also shrubbery in some spots, tossing up green waves against the precipice; and broad sheets of ivy here and there mantle the head-long rock, which also has a growth of weeds in its crevices. The Castle walls above, however, are quite bare of any such growth. Thus, looking up at the old storied fortress, and looking down over the wide, historic plain, we wandered half-way round the Castle, and then, retracing our steps, entered the town close by an old hospital.